Sometimes we need to make audio recording from some sources such as Youtube miusic clips, parts of dialogues in the movie, record voice or capture audio background from game, edit/cut it quickly and save audio file. 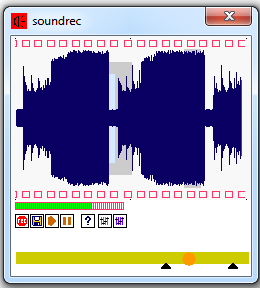 We designed a little sound recorder/cutter for Windows to do same things fast. It was tested only on Windows 7, so we cant guarantee it will work in others Windows versions, but this program have a small size and absolutely free. Sound Recorder Cutter can record any audio backgrounds, you can cut recorded sound on fly and save audio file as *.wav. Download Sound Recorder Cutter from our site here.